The Shiretoko peninsula, in northeast Hokkaido, is one of the world’s richest north temperate ecosystems and one of only four Natural World Heritage sites in Japan. A coastal community with a long history and far-reaching involvement with its natural surroundings, the area demonstrates a uniquely balanced interaction between terrestrial and marine ecosystems. Shiretoko is unusually rich in biological diversity, which includes several endangered species, and it has a deep-rooted cultural heritage built up over many generations of fishing families. It lies at the southernmost limit of the seasonal ice floes in the northern hemisphere, and is exposed to both the East Sakhalin cold current and the Soya warm current, each bringing a different set of oceanographic conditions. 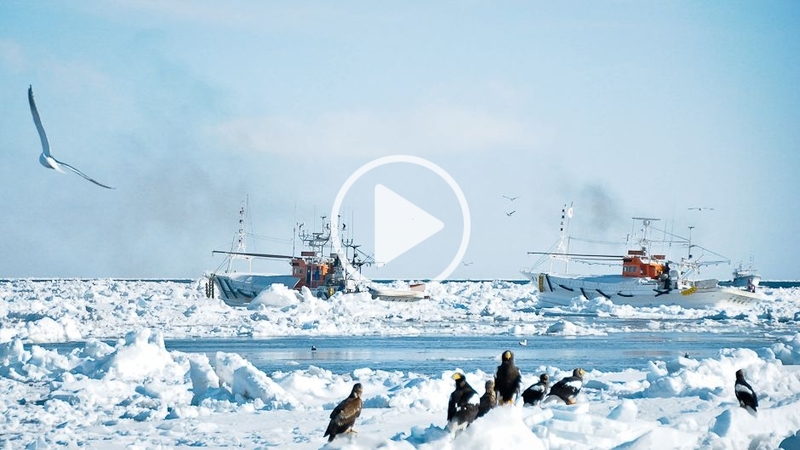 Furthermore, borne on cold water from the Sea of Okhotsk, a stream-like marine ecosystem — where a huge mix of organisms lives and migrates — also passes through. The area’s exceptional ecology is matched by its cultural significance, in that it provided the historical landscape for Ainu communities. These indigenous people of Hokkaido traditionally practised sustainable use of regional resources in observance of an animistic system of beliefs that affirmed a close spiritual link between nature and humans. “Shiretoko” means “the end of the Earth” in Ainu language. Archaeological surveys show that people have been living in this area for more than two thousand years, leaving behind clay pots, and the bones of Steller sea lions, seals and fish. In early spring, when the sea ice melts, the bloom of ice algae and other phytoplankton attract diverse marine life in the higher trophic strata (level in the food chain), including a wide variety of fish. The area’s high primary productivity (phytoplankton) supports a wide variety of species of fish, marine mammals and seabirds. The area lies on a migration route for salmonids, spawning ground for walleye pollock and a rich diversity of commercially important fish species, such as arabesque greenling, rockfish, Pacific cod, flatfish and cephalopods including Japanese common squid. Also, a large number of anadromous salmonids return from the sea to spawn in the streams where they were born, providing food for large terrestrial mammals like brown bears and Blakiston’s fish owls, and in that way connecting the terrestrial and marine ecosystems. Today, the fisheries sector is still the most important industry in the regional economy, supporting one of the most productive fisheries in Japan. Their main target species and fishing gear include salmonids caught by set net, common squid caught by jigging, and walleye pollock, cod, and arabesque greenling caught by gillnet. In 2009, there were 1,994 fishers engaged in the industry, producing more than 80 thousand tons, worth ¥25 billion. In December 2007, a Multiple Use Integrated Marine Management Plan was drawn up by a working group of experts in marine and terrestrial ecosystems, with participation from the fisheries sector in the drafting process. The Management Plan recognizes that the local fishers are an integral part of the ecosystem, and their data is utilized to monitor the ecosystem in a cost-effective way. Walleye pollock is one of the species most sought after by fisheries in the Shiretoko area. Shiretoko fishers catch the Nemuro Strait stock of walleye pollock mainly by gillnet. Gillnet fishers have divided the fishery ground into 34 areas, based on their local knowledge and experience, and to conserve resources they declared seven of these areas protected, including a portion of the walleye pollock spawning ground. After Shiretoko’s nomination for World Heritage listing, another three areas were designated as protected, and the protected areas are re-examined every year on the basis of the previous year’s performance and scientific advice from the local research station. Moreover, the Stellar sea lion population has been gradually increasing 1.2 percent per year since the early 1990s and in 2007 the Fisheries Agency of Japan revised the procedure for setting the cull limit, basing it on the potential biological removal theory that is used under the US Marine Mammal Protection Act. Many anadromous (ocean-dwelling fish that move into freshwater to reproduce) salmonids return to rivers in Shiretoko to spawn. Wild salmonids (including hatchery-derived chum and pink salmon that reproduce naturally in rivers) running upstream serve as an important source of food for terrestrial mammals and birds of prey and they contribute to biodiversity and sea–land material circulation. To maintain and facilitate the interactions between marine and terrestrial ecosystems, dams and other engineering works have been modified since 2005 following scientific advice. 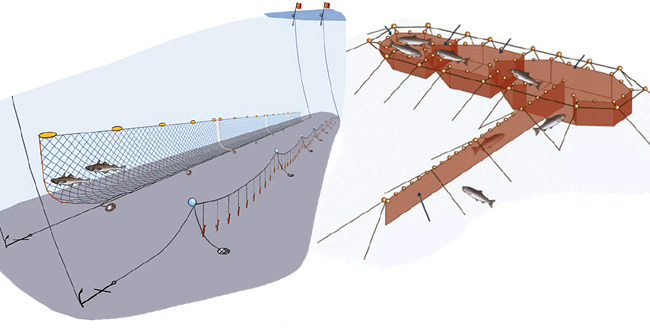 Experts surveyed 118 artificial constructions in Shiretoko and evaluated their impact on salmonids. They investigated possible structural modifications, taking into account their effects on disaster risk. Some of the constructions were retained because modifications could have increased the risk level of disaster in densely populated areas. As of the end of January 2008, 25 structures had been modified or were being modified. To evaluate the effects of these measures, a three-year programme is monitoring the upstream run, number of spawning beds, substrate composition, current velocity and discharge. To prevent negative impacts from tourism on local fisheries and the marine ecosystem, the Marine Management Plan specifies that recreational activities are to be managed under rules formulated by the Proper Use and Eco-Tourism Working Group. This Working Group is composed of academics, tourism and guide representatives, environmental NGOs, and officers representing forestry, coast guard, environment and local government. The committee stipulates patrols and other activities to monitor tourist uses, formulates rules for tourists and promotes ecotourism. The Shiretoko approach to the co-management of marine resources is unusual in that it involves a wide range of stakeholders from several sectors. This facilitates the exchange of information and opinions, and strengthens the legitimacy of the management plans and rules. The long history of central institutional involvement of fisheries in Japan has resulted in a different ecosystem-based management framework than, for example, that of Iceland or New Zealand, where market-based individual transferable quotas are the central policy tool. This contrast is another illustration that there is no single path to conserving marine ecosystems and sustaining livelihoods. In the Shiretoko approach, local fishers are not something to be managed or controlled, but indispensable, self-driven role players in ecosystem-based management, through the provision of critical ecosystem monitoring information and their proactive involvement in conserving marine resources. This article is an abbreviated version of the paper: Makino M., H. Matsuda and Y. Sakurai. 2011. “Shiretoko: Expanding Fisheries Co-management to Ecosystem-based Management in Biological and Cultural Diversity in Coastal Communities: Exploring the Potential of Satoumi for Implementing the Ecosystem Approach in the Japanese Archipelago. Secretariat of the Convention on Biological Diversity Technical Series No. 61. 18-23. Satoumi – Co-managing marine resources in Shiretoko by Mitsutaka Makino is licensed under a Creative Commons Attribution-NoDerivs 3.0 Unported License. Mitsutaku Makino is Head of the Fisheries Management Group at the National Research Institute of Fisheries Science of the Fisheries Research Agency of Japan. He specilizes in fisheries and marine policy analysis and is the author of “Fisheries management in Japan: its institutional features and case studies”, published in 2011 by Springer. He holds a M.Phil from Cambridge University and an M.A. and Ph.D. from Kyoto University. Hiroyuki Matsuda is a professor at Yokohama National University. His research encompasses adaptive management and co-management of marine protected areas, risk analysis and game theory. He is the author of two Japanese textbooks on ecology, one of which focuses on the science and ecosystem management of fisheries. His theoretical work on fisheries management has resulted in new ideas, including the “cyclic advantage model” of sardine-anchovy-chub mackerel, in which Matsuda proposed a hypothesis for small pelagic fish stock fluctuations and “target switching”, a novel multi-species management strategy. He is the president of the Ecological Society of Japan (2012-2013). Dr. Yasunori Sakurai is a professor in the Faculty of Fisheries Sciences at Hokkaido University in Japan. His research focuses on reproductive biology, strategy and stock fluctuations of gadid fish (walleye pollock, Pacific cod, and Arctic cod) and cephalopods (ommastrephid and loliginid squids) in relation to climate change, and the biology of marine mammals (Steller sea lion and seals). He has directed a number of national research projects and programmes focused on ecosystem-based management for sustainable fisheries in Japan. He has been a member of the Cephalopod International Advisory Counsel, Ecosystem Study of Sub-Arctic Ecosystem and the The North Pacific Marine Science Organization (PICES). He has been chair of the Japanese Society of Fisheries Oceanography since 2009.